If you'd like the download version just use the coupon code HALFPRICE to get 50% off at checkout. Posted in By Casey, DVDs on September 6, 2012 by admin. Casey's Christmas Collection - Since this contains my homemade lessons it is only available directly from The Murphy Method, not through other retailers who carry our digital products. Also, Leaping Brain (our downloads partner) has been busy improving their video player. You can now put your videos on all your different computers. You can play your downloads on all Apple devices (iPhone, iPad, iPod Touch, or stream it on Apple TV). The player also now features a looping function so you can play one lick over and over. AND you can SLOW DOWN or SPEED UP the video, without changing the pitch, which is especially helpful for the slow and fast jam DVDs if we play them too fast or two slow to suit you. We have a new demo movie that explains all these functions. You can watch it right here. Or you can go straight to the catalog and start shopping! Posted in banjo, By Casey, DVDs and tagged digital downloads on July 5, 2012 by Casey. Posted in By Casey, DVDs, Video clips and tagged Harmony Singing Made Easy on April 20, 2012 by Casey. The Murphy Method, known world-wide for its “learn music by ear” teaching, now turns its attention to harmony singing. 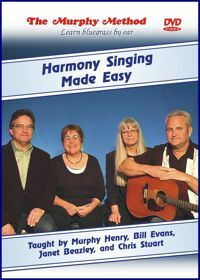 On Harmony Singing Made Easy we teach you to sing harmony by ear. It’s the easiest method ever. On this brand new DVD, Murphy and friends Bill Evans, Janet Beazley, and Chris Stuart join together to sing some beautiful trios and quartets. First you hear the three (or four) voices blending together, then you hear each harmony part sung separately. You learn your part by singing along with us. With three separate parts to choose from, you can pick the one that best suits your voice. One creative approach we have taken is that we sing several songs in three different keys so no matter what your vocal range (female or male, high or low) you can try your hand at singing the lead part. We provide keys to fit high voices, middle-range voices, and low voices. Sometimes the men (Bill, Chris) take the lead; sometimes the women (Murphy, Janet) take the lead. The harmony parts are then worked out to fit the lead voice. With the choice of three keys, you can also find a harmony part to suit your voice. For instance, Murphy sings Will the Circle Be Unbroken in the key of A, while Janet adds the tenor part (above the lead) and Bill adds the baritone part (below the lead). Then Janet sings the lead to Will the Circle in the key of C while Murphy adds the baritone (below the lead) and Bill provides the low tenor (below the baritone). Finally Bill takes a turn singing the lead to Circle in the key of E (a pretty low key for this song) while Murphy adds the tenor (above the lead) and Janet comes in on the high baritone (above the tenor). We also use this same approach—three different keys—for Bury Me Beneath the Willow and All the Good Times are Past and Gone. For the song Don’t This Road Look Rough and Rocky we use just one vocal arrangement with Chris singing lead in the key of G while Murphy sings tenor and Bill adds the baritone. Amazing Grace and Over in the Gloryland are done as quartets so you bass singers can have a chance to get in on the action! Along the way we offer some helpful hints such as “What key do I sing in?” “How do I find my harmony part?” and “How can I get a good blend?” At the very end Murphy and Bill break out their banjos for a rousing quartet version of Over in the Gloryland. Very entertaining! Order your Harmony Singing Made Easy DVD today and join in the fun! Songs: Will the Circle Be Unbroken, Bury Me Beneath the Willow, All the Good Times Are Past and Gone, Don’t This Road Look Rough and Rocky, Amazing Grace, Over in the Gloryland. Posted in DVDs, Learning By Ear and tagged Harmony Singing Made Easy on April 4, 2012 by Casey. The New “Banjo Backup for Fiddle” DVD is now available! Call us at 800-227-2357 ! I'll be at the phone most of the afternoon! How does a banjo best accompany a fiddle? By playing simple roll patterns that fit the chords. Casey and Murphy explain these patterns note-by-note as Megan Lynch plays fiddle. Posted in banjo, DVDs on October 21, 2011 by Red Henry. 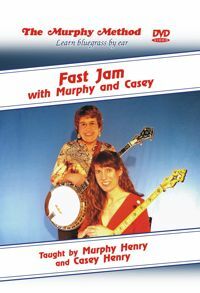 You all will be the first to know that our BRAND SPANKIN' NEW DVD is ready and waiting for you to order it: Fast Jam with Murphy and Casey. We previously wrote about filming it here. It's not available via download quite yet, but should be in about three weeks or so. If you happen to be coming to Banjo Camp North this weekend you can get your copy in person from Casey, because she'll have them with her there! Posted in By Casey, DVDs and tagged fast jam DVD on May 10, 2011 by Casey. Since Casey has already done such an excellent job telling you about the basics of the new Fast Jam DVD, I thought I’d give you some of the inside scoop. First of all, I must say it was completely delightful to have Casey back at home for four days. I fixed us oatmeal and tea for breakfast every morning and was rewarded by her taking care of those little things that mean so much: bagging up the trash, cleaning up the kitchen, playing Scrabble with me. Beating me was going above and beyond the call of duty, but it did make for a most interesting game! Friday morning, we were ready to roll a little after 9:30 a.m. Casey, Steve, and Malia were positioned in front of the backdrop, tuned and waiting and chatting amongst themselves. Where was I? I had decided, at that exact moment, that I need to clean my banjo head, so I was in the kitchen with the 409 and a paper towel trying to remove five or ten years worth of gunk that had accumulated around where I plant my fingers. Oh, and there was blood, too, from when I pricked my finger on a string end and then daubed it on the head. Why? I have no idea! It just seemed like the thing to do at the time. Most of the gunk came off, but not all of the blood! When I got to the studio, I told Casey about my imaginary blog but she didn’t think it was as funny as I did. We started off with a couple of tunes that were easy for me to play on banjo because I’ve been playing them (and teaching them) so long: Sally Goodwin and Salt Creek. It’s always wise to start with something easy in hopes of getting a good recording vibe going. Those went well, and we were off and running. We were hoping to get at least 20 songs down for the DVD, so we were looking at putting in some serious recording time. As it turned out, we got about 10 songs the first day and 10 the second day. And let me tell you, when we got done on each day I was a whipped puppy! Saturday, after we’d wrapped up the DVD, Casey and I went to lunch with two of my fiddle sisters, Patty and Robyn. We thoroughly enjoyed a couple of hours of girl talk, the content of which I can in no way reveal in this (mostly) family-oriented blog. We, of course, capped off the meal with shared desserts. And then I came back home and took a long winter’s nap, preparatory to square dancing that night! It was a good weekend. I think you’re gonna enjoy this DVD. I hope we can include some of the “bloopers” because I’m just remembering that when we started off on Sally Goodwin, our very first number, I messed up right from the start. And said a bad word. And then I messed up again and said that same bad word. Only a mild bad word. Worse than damn but not as a bad as most of the stuff you hear on TV now. On second thought, I don’t think that would be appropriate material for bloopers. Or even You-Tube. But it was sure funny in the moment. A good time was definitely had while making this DVD and we think you’ll enjoy the end result. We’ll keep you posted on the release! Posted in By Murphy, DVDs and tagged fast jam DVD on March 10, 2011 by Murphy Henry. Posted in By Casey, DVDs and tagged downloads, MM Digital Downloads on March 9, 2011 by Casey.